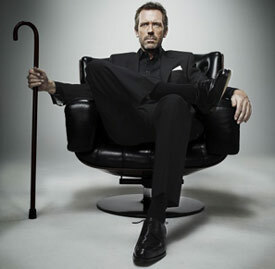 House MD Episodes: Season 7 #701 "Now What?" Recent Episodes :: Episodes :: #701 "Now What?" Would you like to be notified when there are updates, etc.? Check out our new update system. House (Hugh Laurie) and Cuddy (Lisa Edelstein) explore a romantic relationship in the HOUSE season premiere episode "Now What?" airing Monday, Sept. 20 (8-9 PM ET/PT) on FOX. Starting just before House says, "I love you. ": Joe Purdy's "Good Days"
Starts just a few minutes after "Help Me" (from the end of season six) ended. House doesn't do anything medically but causes a crisis when he tells Dr. Cuddy's new assistant to send Dr. Richardson home not knowing that means Princeton-Plainsboro will lose a Level I Trauma Center status and have to close its ER and ICU. When he learns what it means, he tells Chase to pretend to be a neurosurgeon but Cuddy's assistant knows Chase is not board certified in that field. Chase tells the inspector from Health Services that Dr. Richardson is fine and just prepping for surgery. Dr. Richardson thinks he has food poisoning but Chase and Thirteen learn that he has taken two anti-nausea medications and they haven't helped, they think it might be something more. They give him drugs that cure the nausea but then he develops symptoms of being high including taking off his clothing. The team thinks it might be peptic ulcer disease and hepatitis but those don't turn out. Richardson finally admits sneaking out of the hospital when he was supposed to be on call to go to a seafood festival. He ate samples of everything that looked good, he says. Thirteen deduces that he must have eaten toad eggs, which she says can cause nausea and euphoria. The team treats Richardson and the hospital keeps its status at the last minute. Thirteen, perhaps her last diagnosis with the team. Thirteen disappears at the end of this episode. She says she is going to Rome and the team thinks it is for a Huntington's trial but when they finally check after she leaves, Rome's trial does not have her name. House has a sword at home? Hugh Laurie returns as Dr. Gregory House in the seventh season of HOUSE premiering Monday, Sept. 20 (8:00-9:00 PM ET/PT) on FOX. �2010 Fox Broadcasting Co. Analysis of the Medicine from "Polite Dissent": The medical mystery was weak.... [and] the final solution was... quite a jump in logic. Review by Barbara Barnett - coming after the broadcast (see her new book, lots of details through season 6, click on link to the right). At the end of the last episode House reached out to Cuddy for her to help him up from the floor of his bathroom where he had broken into a wall hideaway where he had previously hidden bottles of Vicodin. Now she undresses him to treat his wounds. Then she moves to below his waist and kisses his scarred right leg. They make love slowly, sensually. Later in bed House asks her, "Now what?" "Everything's good. We don't have to talk through it all." "No, I meant it literally. Now what?" He makes some suggestions like breakfast or bowling. But Cuddy does has other plans. "I have to go home, get dressed, go to work." "I'm hoping this is the beginning of it." House then takes a call from her assistant and tells her there is nothing important happening at the hospital because House thinks he has just handled a routine problem. Later he suggests, "I say we turn off the phones and give the morning to us." House responds to Cuddy's hesitation with, "You break off your engagement but you won't change your schedule?" Meanwhile at the hospital, the team learns that Thirteen plans a leave of absence. Later Foreman breaks into her locker and discovers a ticket to Rome where he knows there is a Huntington's trial. He is worried about her and tells her "Do you have anyone going with you to Rome?" Thirteen objects to him breaking into he locker and suspects his motives for caring if someone is going with her but Foreman says, "I'm worried about you. If you want, I could fly over for a few days. Friends." Long before things get that far along, House learns that what he thought was a minor problem at the hospital is a major thing and he calls Chase to get him to fix the "administrative" aspect of the problem. But Chase runs into major problems. And then Wilson shows up at House's since he is worried. House pretends to be his answering machine with, "Please leave a message. If this is Wilson I'm fine, not suicidal, not on drugs, coping very well with the loss of my last patient. So feel free to go about your day without worry." "House, you can't just not show up for work. What's Cuddy going to say?" "If this is still Wilson, she gave me the day off." Wilson seems to go away but later breaks in through the kitchen window and House decides to tell him about Cuddy because Cuddy thought House was trying to hide her. "Cuddy and I are now Cuddy and I. There is an 'I' in Cuddy." But then Cuddy hides and Wilson thinks House is delusional and back on drugs. And Chase is trying to deal with the crisis House caused for the hospital. He and Thirteen are trying to diagnose the neurosurgeon who is sick and without whom, the hospital cannot operate as it needs to. And at House's house Cuddy really has to get back to all her obligations. "I really do have to leave." "That's it? You can't just say that and shut up." "It's just a statement of fact, it's not a debatable proposition." "Right because you can see the future." "No, but I can see the past and you're going to remember all the horrible things I've done and try to convince yourself that I've changed and I'm going to start doing those horrible things again because I haven't changed then you'll realize that I'm an insane choice for someone who has a kid. And from there it's a short step to the inevitable conclusion that all of this was a mistake. Tell me any of that isn't true." Next the two of them are sitting talking. "The only time you're afraid is when you're happy. You just don't expect it to last." "I've done horrible things to you and I'll do horrible things again, to you. Because of one stupid moment with a dying girl in a pile of rubble, you think I can change. Tell me where I am wrong." "I don't want you to change. I know you're screwed up. I know you are always going to be screwed up. But you're the most incredible man I've ever known. You are always going to be the most incredible man I have ever known. So, unless you're breaking up with me, I am going home now." She kisses him goodbye but he grabs her hand and after a moment says the words she had noticed that he hadn't said before. "I love you."